– Over the past five years, the American Federation of State, County, and Municipal Employees (AFSCME) has given over $600,000 to Planned Parenthood, Emily’s List, and NARAL Pro-Choice America. – Service Employees International Union (SEIU) has given $170,000 to Planned Parenthood, NARAL Pro-Choice America, and the Center for Reproductive Rights. 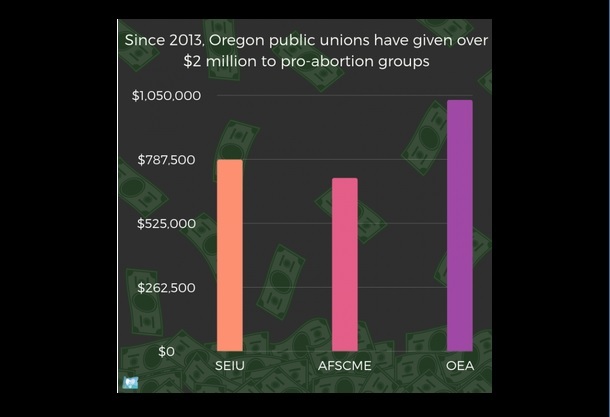 – The pro-abortion advocacy group Defend Oregon has received $1.2 million in funding from AFSCME and SEIU, and nearly $7 million over the past decade from the Oregon Education Association (OEA).